We all have mental health, so it’s okay to start talking about it. Image too large, please try another image. Cancel and upload new image. Upload your chosen image from computer, phone or tablet and crop to size. 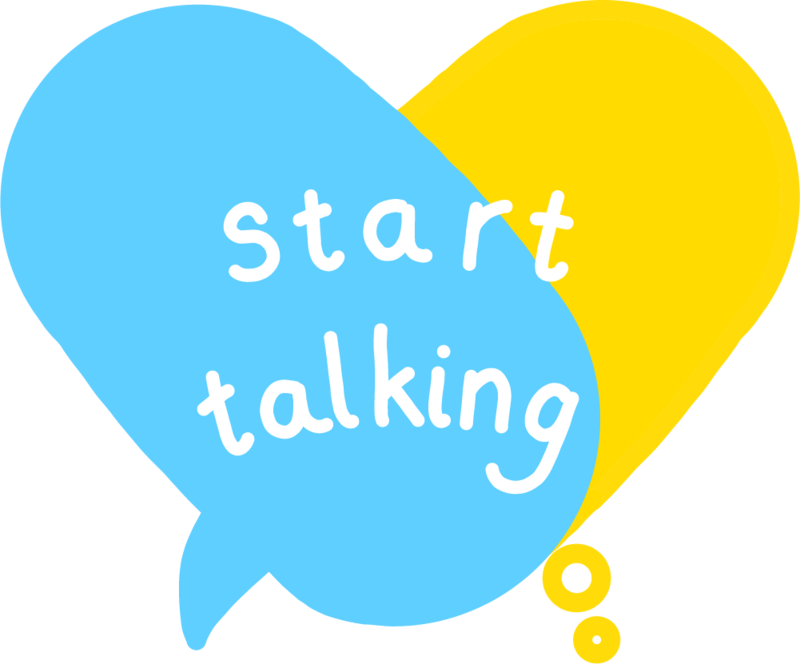 We want you to “Start Talking” about mental health using our digital badge. You can do this by finding a photo which means something to you and uploading it above to put our digital badge on. Then share it on social media with a story about why you think it’s important to Start Talking about mental health. Then tag a couple of your friends, family or colleagues, ask how their mental health is and get them to share their own badge picture. If you don’t want to share your own picture, or don’t feel comfortable speaking about yourself but want to get involved, that’s great as well, you can share the full size badge on your social media. Whatever way you do it, we’d love you to copy in our message above, so we can get other people involved. See Me and Abandon Ship have come together to get people talking about mental health. We all have mental health, it’s part of our day to day lives, and any of us could go through a tough period where we are struggling. Mental health shouldn’t just be spoken about as a problem, if we just think of it like that then the stigma will never go away. So let’s talk about our good mental health, our bad mental health and everything in between. We’re all different, but we’re all people. Mental health shouldn’t define us, and if we are all talking about it, then it can’t. See Me is Scotland’s national programme to end mental health stigma and discrimination. We’re working to change the way people think and behave when it comes to mental health, whether that is on social media, in schools, workplaces, communities or in health and social care. We want to make sure that people who struggle with their mental health have just as much chance to live a fulfilled life as anyone else. Abandon Ship is a Scottish clothing brand based in Dundee. Their aim is to create opportunities. Selling t-shirt has given them the opportunity to achieve everything they have, now they are using that to create positive change for others. Rich, who owns the company, has openly discussed numerous topics to try and change how people think. This includes his on-going personal experiences with anxiety, how it affects him and the impact social media can have. Together we want to start conversations on mental health, and importantly, give people who don’t normally feel they can speak about mental health, a chance. More and more people are finding it easier to talk publically about their mental health and struggles they have had. However there are still a lot of areas where people don’t want to speak out, as they are worried about the reaction they will face. For many this is social media. The fear over how people will react still persists. On the other side, with continually increased dialogue on mental health in the public eye, there are people who know it is important to talk about it, but don’t feel they can as they may not consider they have experienced any problems with mental health themselves. However, if we are to fully remove the stigma around mental health, this means everyone feeling comfortable to talk about it in a helpful, supportive and caring way. With this campaign we want to create a safe space online for people to share their experiences and ask people questions about mental health which normally they may not feel comfortable doing. With all of you we can reach new audiences, help new people to start talking, and most important, show everyone that it is okay not to be okay. This campaign is all about getting us to start talking about mental health. So if you have any questions about mental health, then it’s okay to ask. Use #PassTheBadge and tag @seemescotland and ask us.